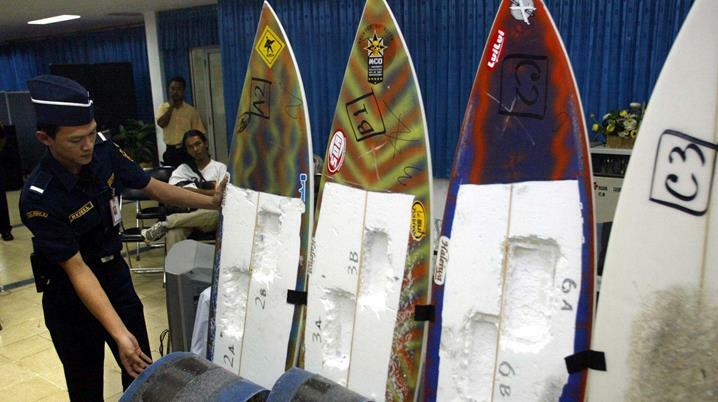 Some of the boards used for drug trafficking. Young surfers who came to Bali in search of perfect waves have become some of the island’s biggest drug traffickers. A new book reveals how the top dealers rose to power by inventing ways of packing cocaine into windsurfing booms and hiring packers to stitch drugs tightly into surfboard bags so they would avoid X-ray detection. At one point, a group of Brazilian surfers made $500,000 by stuffing three kilograms of cocaine into the spoiler of a Porsche and shipping the car to Australia. Many of those involved ended up on death row or in jail. Author and former 60 Minutes producer Kathryn Bonella interviewed some of the biggest players in Bali’s drug world for her new book, Snowing in Bali, which documents their lives of extravagance, surfing and encounters with the law. Rafael had pioneered the boom [the rigid bar the wind-surfer holds onto] method, after surfboard bags became overused. Always wanting to be a step ahead, and have new options, he’d spent weeks studying sports equipment, pondering what to try next. The first boom he packed was the trickiest. He bought the equipment, then set to work in a beach bungalow with Poca. It took them two full days of figuring it out to ensure it would be X-ray-proof. It was a complex job to make the coke invisible. First they put it in a blender to make it baby-powder fine, obliterating any rocks, then they used a funnel to fill the boom. Finally, they used a tailor-made metal rod, with a coin welded to its end, to pound the coke down hard into the aluminium tube to compact and cement it, and eliminate any air bubbles. This first time, their technique was imperfect – they lost 2 per cent of the coke, as the fine dust blew all over the room, covering them. F—, it was a big job. That night my body was so tired, pain in my muscles, my hands full of bubbles, I can’t sleep; I was totally f—ed. The next morning, a fine mist of snow had settled on the room, covering everything, and they quickly got high again. But they finished the job, sent the boom with its invisible kilo to Malaysia, made $65,000 and, most importantly, had a new winning method. The pair flew to Peru to teach their packers there how to do it, under strict orders to keep it secret. Obviously, there were no patents in the drug business, and before long horses would talk, booms would get busted, and other traffickers would become aware of the method, but for the time being it belonged exclusively to Rafael and Poca. Snowing in Bali will be released on Tuesday October 23rd. For more information visit kathrynbonella.com.